Flint Expatriates: Flint Photos: Civic Park in 1919? Look at the 1920 Flint Quadrangle from that other link for a clue. I see literally 100 or more long city blocks in that area that show solid rows of houses like that. You need to narrow it down as to what actually constitutes Civic Park as I wasn't sure because the names of the streets weren't there. The corner of Forest Hill and Forest Hill is close to the northern limit of this development, and is visible on the Quadrangle Map. The Quad might show a space where that bigger house is. Good thing most people got along then. Those were very close living quarters. But I'm sure there were much worse situations everywhere else. The Cramdens come to mind, where Art imitates life. Maybe they were Cramdens because they were all crammed together. That doesn't look like Civic Park at all. The trees are too big for a subdivision that was built in 1919. If that is even Flint, my guess is that it is a photo of the Oak Park or St. John Street neighborhood. Civic Park had only a handful of very specific house designs. Nothing here looks like any of them. It may indeed be a Civic Park neighborhood, but in a different city or state. This may be somewhere in Ohio. There are some houses there that look similar to ones in Flint, but many of them have a small third story like these. You're right, the Flint ones didn't have the third story. You had the regular gable style and the mansard style second floor, but not a third story. The duPonts did finance these. But the 1920 Flint Quad shows many blocks with rows of houses so closely spaced they didn't show the individual houses. I don't think this is Flint. The houses are too close together- no driveways. No driveways means there would have to be alleyways. Then again, I don't see any garages. Either way, no neighborhood in Flint that I know of had extensive alleys. Those weird chimneys don't look very Flint-like either. Two blocks over on the right, there is a section of flat-roofed row houses. Did Flint's Civic Park have any brick row houses? My estimate is that the depicted houses might be on fifty foot lots. Was any of Civic Park that tight? My Mom grew up on Chippewa north of Hamilton. Some of those houses were that close to each other...specifically, there was a shared driveway between two houses, and it touched both houses; the next separation was a little wider and was grass; then another shared driveway. That neighborhood also had alleys alternating with streets. The depicted neighborhood appears to have been built as a subdivision, because there's considerable uniformity in the architecture, at least on a given street. Given the tree sizes, and assuming that the picture does date from 1919, what Flint neighborhoods were built in roughly 1900? The internet may not know anything, but it's pretty good on geography and neighborhood names if they've ever been in the news or were the place of origin of anyone notable. I can find a number of Civic Parks other than Flint's that are actual parks, but so far only one that's a neighborhood. Salisbury, NC has one. It's interesting to look at the Quads. It looks like many of the streets shown were right of ways, and many were perhaps not built yet, as there are whole subdivisions with no houses shown on the streets. It looks like Milbourne went to Bagley Ave., and Fremont St. was linear and went south to a single building in 1920 before Mott Park was there, even the old part. Hargott is shown as going all the way to Markham, but Unclebuck said it ended at the Huron St. cul de sac. The streets north of Berkley and south of Mackin Rd. show as having right of ways from Milbourne to Chevrolet Ave. before Longfellow was built in 1927. The newest Woodcroft Estates subdivision next to the present day Swartz Creek Golf Course shows a house or two on Colchester Road, which appears to have been the half section line and the right of way was linear at the time. There are also a few houses that appear to be on Westwood Parkway and Parkside Drive today, but the right of ways weren't there, some old linear right of ways parallel and perpendicular to Miller Rd. were there in the eastern part of the subdivision. It looks like the new right of ways were adjusted to accommodate the houses that were built on the old right of ways. The house on Parkside Dr. near the corner of Miller Rd. and behind the yet unplatted Woodbourne Dr., that was originally built by the Davison family, is shown on the Quad. An incredible house. You could win a lot of bets showing people a picture of it and telling them that the house is in Flint. I bet not one in ten people would believe you. 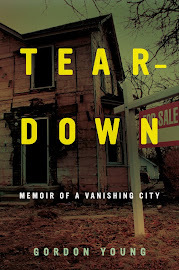 Too bad Flint can't rebuild on that reality and not the reality of the city disappearing before our eyes. Several streets on the future combined campus of Emerson, Northern, and Garfield schools: The section of Alexander Street between McClellan and Pasadena, and the sections of Jamieson and Dewey between the unbuilt or abandoned Alexander St section and Buick St (which is not shown on the 1920 map). The sections of Dartmouth St and Jackson Ave between Dupont St and Iroquois Ave (through what later became Iroquois Park). A short section of Commonwealth Ave that would have connected to the intersection of Longway Blvd and Dort Hwy. In short I agree with the general consensus (on this blog page and the Facebook page). This photo was mislabeled by the Flint Journal, and further it is not a photo of any Flint neighborhood. The apartments seen near the top of this photo and the other house styles and density are not found anywhere in or near the Civic Park neighborhood in Flint. The prominent foreground house is also on a narrow triangular block which only contains three houses. The only similar triangular block in Civic Park was bounded by Dartmouth, Lawndale, and Eastlawn. However that block had 4 houses and the street intersection angles were not as acute as the one pictured here. 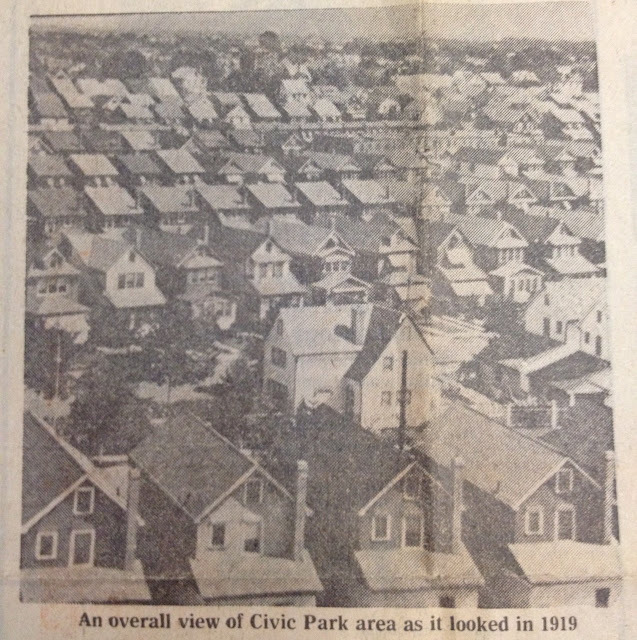 On page 169 of the Flint Journal's Centennial book "Picture History of Flint" is a 1920 aerial photo of the Civic Park neighborhood. That photo was taken one year prior to the construction of the elementary school, but just after most of the houses were built near the school site. The distribution of houses is precisely as it is depicted on the 1920 Flint USGS quad. Also there were virtually no trees on the built house lots, unlike the many trees seen in this supposed 1919 Civic Park photo. Catskill Hiker, can you look up about the WTAC-TV tower in the "Picture History of Flint" book and see if the tower that collapsed on Lapeer Rd. in a tornado in the 1950s was 470 feet tall according to the book? It was where the shorter tower of about 250 feet is now where the WJRT-TV studios are. I can't find that book anywhere. The 470 foot height is 100 feet taller than any other tower built since in Central Genesee County, and I'm curious as to why no tower can be raised now more than 370 feet. It's an FAA policy that keeps kicking out any proposal for more height, but I have to wonder why it is so restrictive compared to other cities, and that there was even a precedent for a much taller tower. The WTAC-TV tower at 2302 Lapeer St. was 467' tall, per page 232 of the Flint Journal's Centennial book "Picture History of Flint". Thank you Catskill Hiker for the information I could recall but not put my hands on. There are several blogs and posters who take an interest in the history of WTAC-TV, Flint's first TV station that operated for four months in 1953 and 1954. Gary Flinn and the guy that often posts as Mancino Mark will also appreciate the information. Many UHF TV stations only operated for a short time back in the 1950s, but it was the long period from 1954 to 1958 that left Flint without a local TV station that is important. Flint was the largest city in the US without a TV station during that period, partly due to FCC and legal wrangling between applicants for Channel 12. WJBK-TV, WWJ-TV, WXYZ-TV, and WJIM-TV, while providing only a marginal fringe are signal over the area requiring a large outside antenna instead of simple rabbit ears, were more than happy that the situation continued as long as it did. They got the advertising revenue that should have stimulated the local economy. They weren't the ones that had to deal with the big rooftop antennas falling down all the time. The more I look at this, the more I think this is Cleveland. Many of those houses look a lot like the one where the Castro brothers were holding those young women. And the houses would be more likely to be that closely spaced in Cleveland. None of those houses in the picture have the slate covered hip roofs of the Civic Park area. The lots in Civic Park are 50x100, except along Chevrolet Ave. where the lost are 50x150. The larger lots were originally for the plant foremen. Sooo not Flint. If anything, sortof reminds me of the opening & closing credit scenes of "All In The Family". Which were shot in Queens, NYC.